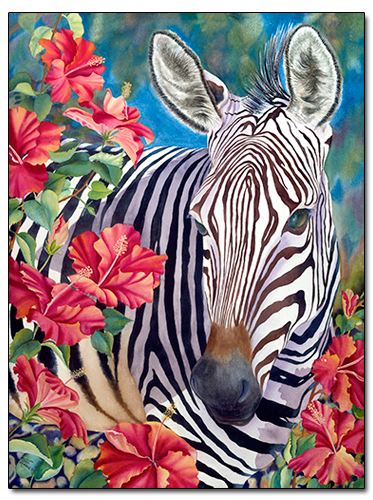 Enjoy the patterns nature presents in this dynamic watercolor painting of a zebra who just happens to walk through blooming hibiscus flowers. This painting is available as a Limited Edition Giclée print on either canvas or watercolor paper. There are 250 signed and numbered prints and 30 artist's proofs in the edition. When the edition is sold out, the file will be destroyed. When you make your selection, click on the Add to Cart button to finish your purchase.